VitalSleep and SnoreRx are quite similar in more than one aspect, which is why users often have a hard time choosing between them. However, they may prove to be a lot more different than you initially believed. This VitalSleep vs. SnoreRx comparison will show you exactly what makes one of these solutions better than the other and allow you to quickly reach your decision. SnoreRx is one of the best mandibular advancement devices on the market because it allows you to customize and dial in your jaw settings. With exact specifications, SnoreRx allows you to maximize the impact of your anti-snoring products. Save $104 when you buy two! SnoreRx mandibular advancement device usually lasts for 9 to 11 months, but it can last for up to 15 months with proper use and maintenance. Snorers with bruxism may have to replace their device sooner. SnoreRx mandibular advancement device is made of a medical-grade copolymer. It is free from Bisphenol A (BPA) and latex. SnoreRx mandibular advancement device is highly customizable. It employs the boil-and-bite technique to achieve a custom fit. The boil-and-bite procedure can be repeated up to 3 times. Furthermore, the device is adjustable, allowing the user to adjust the jaw section in 1-millimeter increments. With SnoreRx mandibular advancement device, the adjustment period is much shorter than with many other devices of its kind. Usually, snorers get accustomed to the device after 3 to 5 nights of consistent use. 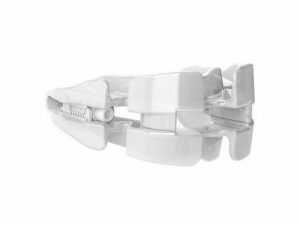 SnoreRx mandibular advancement device is certified by the American Academy of Sleep Medicine. It is an advanced solution designed to reposition your jaw and allow for unobstructed oral airflow while letting you freely breathe through your mouth thanks to the unique V-Flow technology. Its exceptional customizability makes it easy to achieve an optimal fit for maximum effectiveness. It has proven to be effective even in the heaviest of snorers. SnoreRx mandibular advancement device should be brushed with a toothbrush and toothpaste every day. For optimal cleaning results, you can use an ultrasonic cleaner. Every week or every other week, the device should be cleaned with a denture solution. After cleaning, allow the device to air-dry before storing. Mouthwash, dishwashing soap, ammonia, bleach, and other harsh, abrasive cleaners should not be used for cleaning SnoreRx due to potential damage. Slight obstruction of oral breathing. Snorers who have implants/crowns/caps (without a dentist’s approval). SnoreRx mandibular advancement device comes with a 30-day money-back guarantee. If you are not satisfied with the device, return it within 30 days of purchase and get a full purchase price refund, excluding the shipping costs. SnoreRx mandibular advancement device does not come with a warranty. Great anti-snoring mouthpiece but the numbers are actually really hard to read for me. I’ve been battling with snoring for quite a while now. Tried 4 different mads and they either didn’t sit right in my mouth or simply didn’t work for whatever reason. SnoreRx finally let me sleep right until my time to get up and I don’t have to fight sleep at work anymore. I really like the range of motion Snorerx gives me since it doesn't feel so constrictive like my jaws are plastered shot or something. I can also breathe through my mouth which is a great help since my nose is downright useless and I can adjust the device to fit my jaw perfectly. It feels like it was custom made just for me and most importantly it allowed me to have a proper night's rest for once. Both VitalSleep and SnoreRx are moldable. They are fitted with the use of the boil-and-bite technology, which does not require too much effort. Although the process of fitting is simple with both devices, it is somewhat shorter with VitalSleep. We are happy to say that VitalSleep and SnoreRx are cleared by the FDA, so there is nothing to worry about when it comes to the materials used to make the devices. However, SnoreRx may be a bit more comfortable due to the patented copolymer materials it is made of. SnoreRx is incredibly adjustable, thanks to its Flex-Jaw technology that allows you to adjust the device by 1-millimeter increments. Securing the device in the desired position is just as easy due to the amazing Posi-Lock feature. VitalSleep’s adjustability is not as impressive, but the device does allow for micro-adjustments with the use of the hex key that comes with the device. SnoreRx has a rather long lifespan of approximately 11 to 15 months. On the other hand, VitalSleep can last between 12 and 24 months and you even get free replacements for a year. Therefore, while SnoreRx does quite well in terms of longevity, VitalSleep may be slightly better in this respect. VitalSleep is a bit more affordable than SnoreRx. However, SnoreRx does have some advanced features, which justifies the somewhat higher price in comparison to its competitor. When it comes to overall experience, we could easily call it a tie as both the devices are super effective when it comes to stopping snoring.